Written by Pamela Smiley on March 20, 2018 . Posted in Uncategorized. 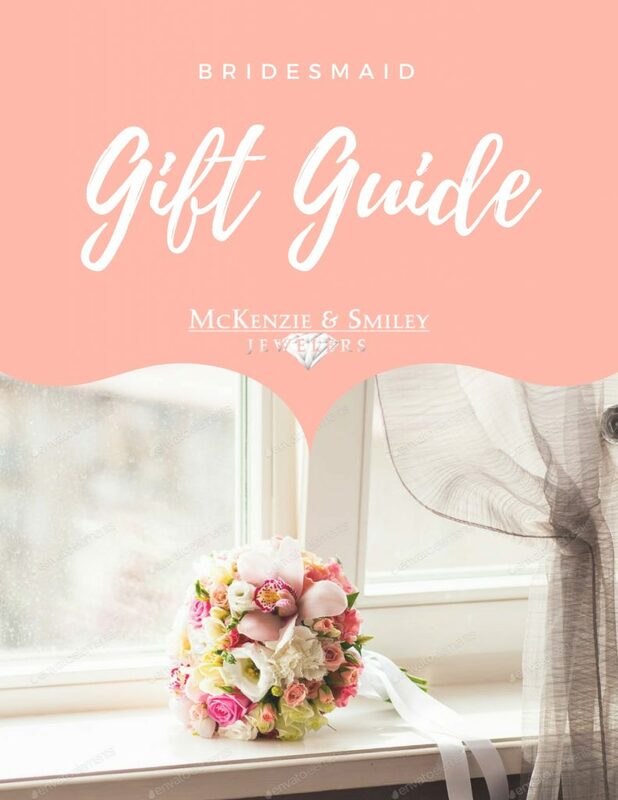 McKenzie & Smiley Jewelers is celebrating 30 years of providing high quality jewelry and service to their customers in Clarksville and the surrounding communities. Norris Smiley opened his first store in Clarksville in 1988 in Cunningham Plaza on Fort Campbell Blvd. When asked about how the industry has changed over the years, he said the availability of product over the internet has changed the jewelry business as a whole. “He has helped us grow to what we are today being voted Clarksville’s ‘Best Jeweler’ for over ten years in a row,” said Smiley. Recently Bryan’s wife Pamela joined the business and brings her years of experience as a diamond wholesaler to stores across the country. Smiley said the business also carries high quality jewelry lines. 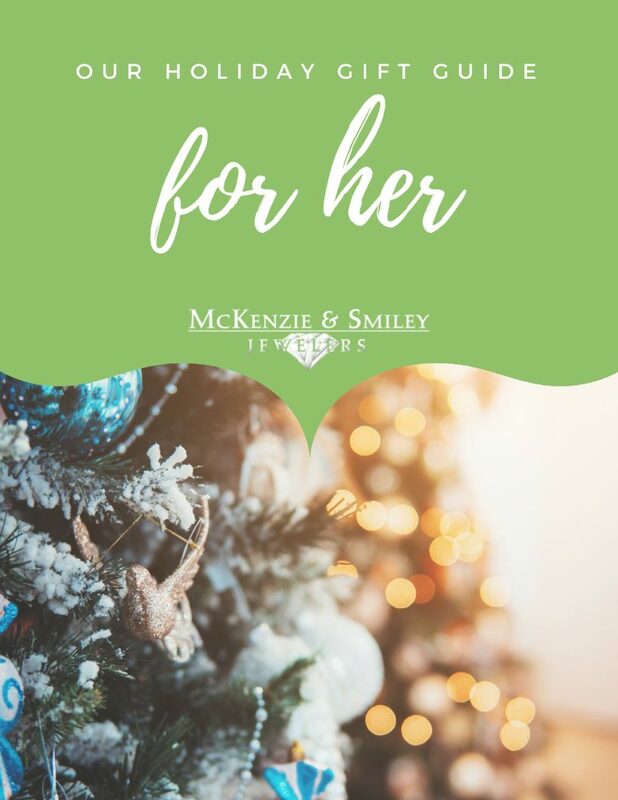 We want to thank all of our loyal customers that have been so faithful to us for the past 30 years and inviting all those that we haven’t met yet in the community to come by and see what McKenzie & Smiley Jewelers is all about. 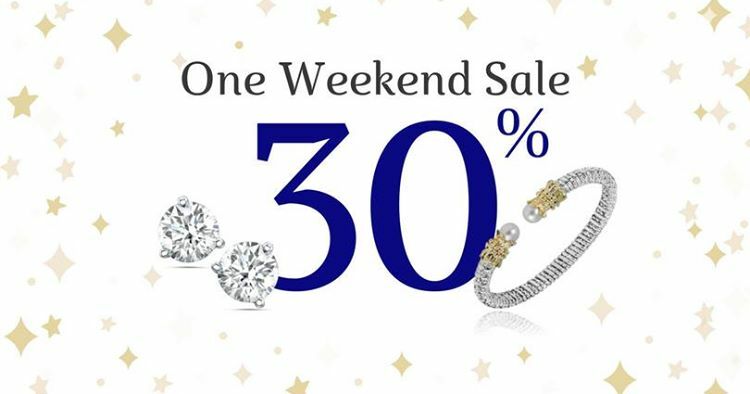 Join us for our two-day 30% off sale to celebrate our 30-year anniversary! Join us on March 23-24, 2018 to celebrate! 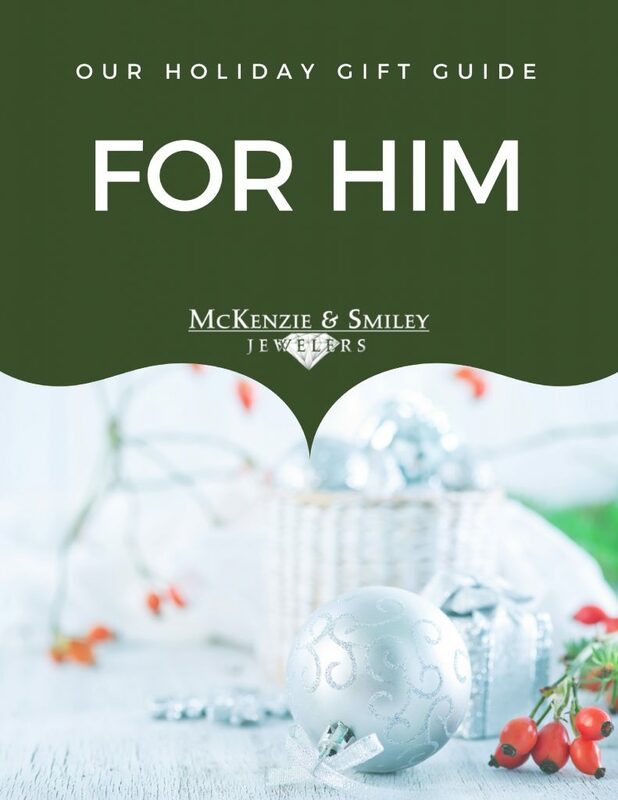 McKenzie & Smiley Jewelers offers two locations in Clarksville to serve their customers. 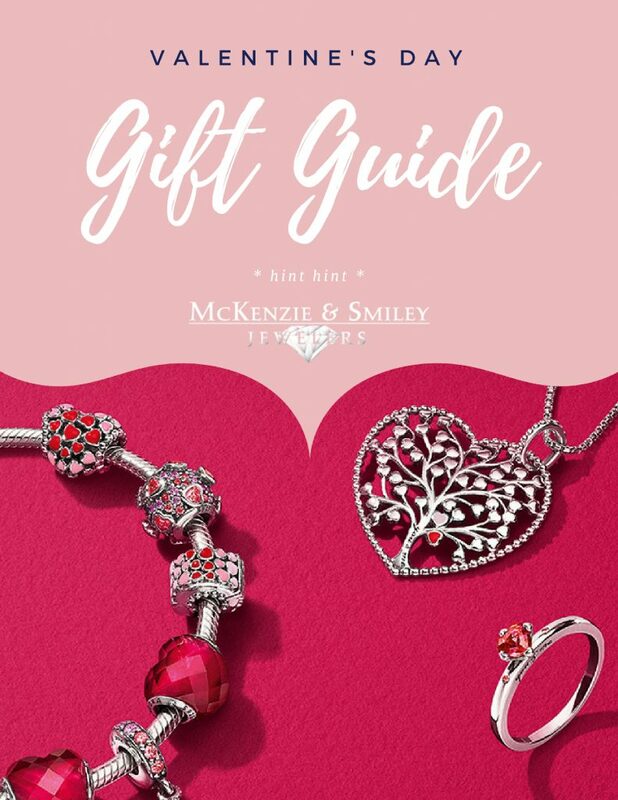 Visit them at 2794 Wilma Rudolph Blvd., 2321 Madison St. or go to mckenziesmileyjewelers.com. Written by Pamela Smiley on February 5, 2018 . Posted in Uncategorized. Written by Pamela Smiley on November 28, 2017 . Posted in Uncategorized. Written by Pamela Smiley on September 25, 2017 . Posted in Uncategorized. Written by Pamela Smiley on June 14, 2017 . Posted in Uncategorized. Here at McKenzie & Smiley, we couldn’t agree more. 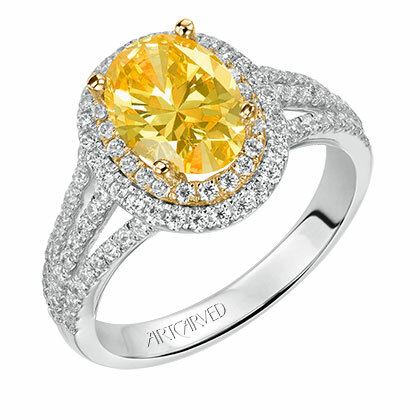 The June birthstone is timeless, elegant, and always in style. Pearls have been coveted for ages; the first fresh and saltwater stones were harvested over 6,000 years ago and their natural rarity meant they were a symbol of wealth. While the process of culturing pearls has made them more widely available, they are still considered very special stones and are often reserved for life’s most important occasions. Pearls are said to symbolize wisdom gained through experience. They are thought to attract wealth, bring luck, offer protection, and strengthen relationships. In Eastern cultures, the beautiful June birthstone is also considered a symbol of transformation, signifying its wearer’s generosity, purity, and honesty. In ancient Greece, pearls were associated with unity and love and were believed to lead to a harmonious marriage. Just like the stone itself, this ancient marriage symbolism stands the test of time. 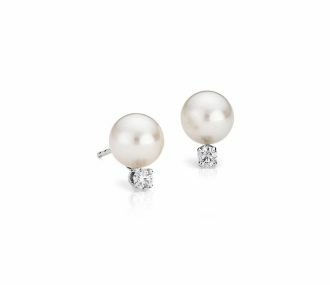 Pearls are still considered the perfect bridal accessory…and as the June birthstone, they’re even more perfect for summer weddings! Pearls are often passed down through generations to be worn on the big day — in fact, many brides receive their first strand of pearls from their mother or mother-in-law as a wedding day gift. It’s a fitting tradition, as legend says wearing pearls on your wedding day will guarantee a happy marriage. 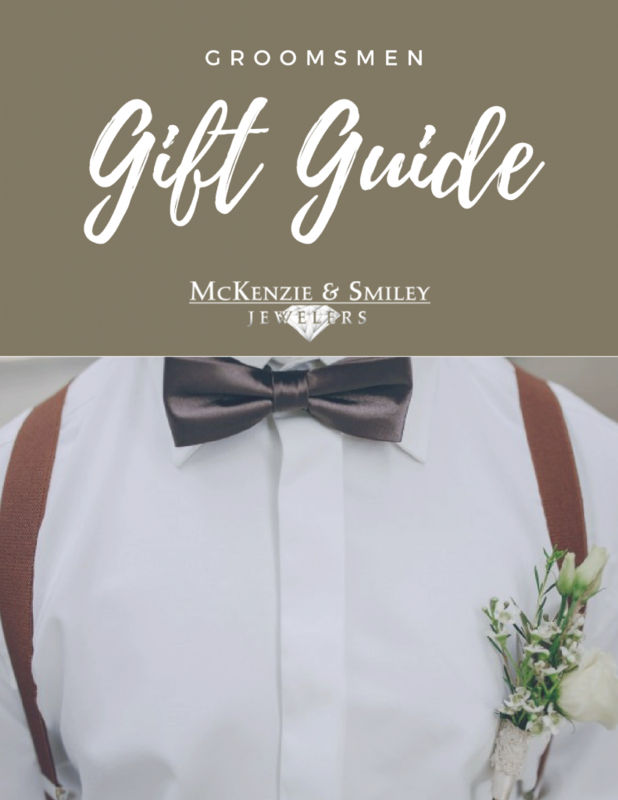 Whether you are the bride yourself or a bride’s relative looking for a special, sentimental gift, there are a few things to keep in mind when purchasing pearls. The most important thing to consider is if a pearl is natural, cultured, or synthetic. You also want to consider its luster, shape, color, surface, and size. These are all things we are happy to explain and assist you with on your next visit to McKenzie & Smiley. The wonderful thing about pearls is that it’s hard to go wrong. No matter the design, a single or double strand necklace, simple or chandelier drop earrings, or pearl bracelets are all equally as elegant and timeless. As Coco Chanel once said, “A woman needs ropes and ropes of pearls.” So whether you’re the bride, Mother of the Bride, a bridesmaid, or simply looking for a timeless and beautiful piece of jewelry rich with symbolism, the pearl is the perfect stone for you. Stop by McKenzie & Smiley this summer to shop our collection of cultured pearls. We’re here to help you find something special. Written by Pamela Smiley on March 10, 2017 . Posted in Uncategorized. What’s that well-known Irish proverb? “Luck will always be on your side if you’re wearing diamonds”? Okay, so maybe we made that up…but if you have to wear green on St. Patrick’s Day, we think it may as well be in the form of a gorgeous gemstone. These three stunning stones are sure to bring you the luck of the stylish this month and all year round. Make sure to read until the end, because we’ve got a special St. Patty’s Day treat for you in stores! Green Jade is considered a stone of abundance or “stone of fortune.” In ancient cultures, jade was thought to increase physical strength, vitality, and longevity (so greens really are good for your health!). 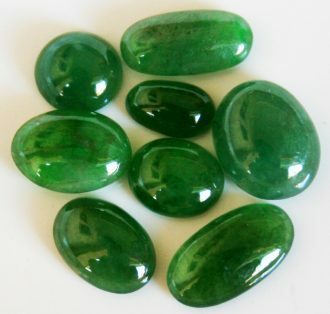 The smooth green stone is also a symbol of love and virtue and can be used to instill confidence and calmness. There are two types of jade gemstones: jadeite and nephrite.If you’re looking for a higher quality piece, make sure you find darker shades of jadeite rather than milkier or minty green. The most valuable form of jade is known as “imperial jadeite,” which carries a vivid, deep green hue. Emerald is one of the four precious stones alongside the diamond, ruby and sapphire. As with jade, deeper shades of green denote a more valuable emerald gem. Considered the “stone of truth,” emeralds have also been said to symbolize abundant love, fertility, and Spring in both ancient Aztec and Roman cultures…making it the perfect stone for March! 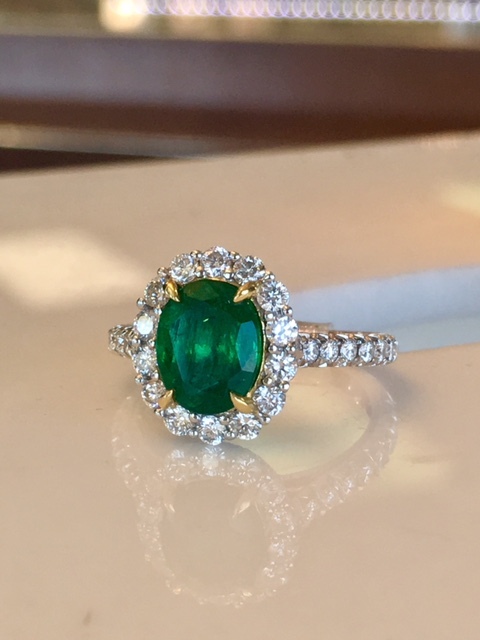 We carry several stunning emerald pieces, including the beautiful 1.82 oval ring pictured above. 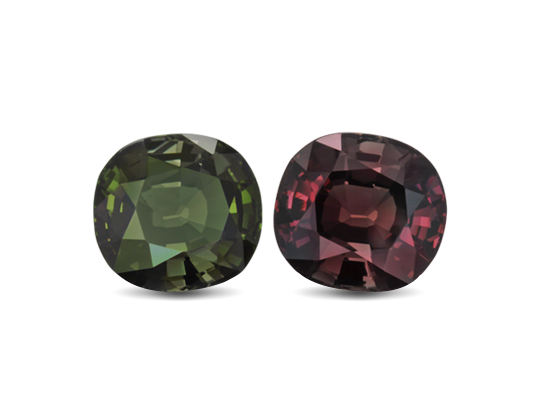 The alexandrite gemstone has been associated with good fortune and is also said to enhance creativity, focus, and self-confidence. Lucky for you, there is a pot of gold (or green!) at the end of the rainbow! 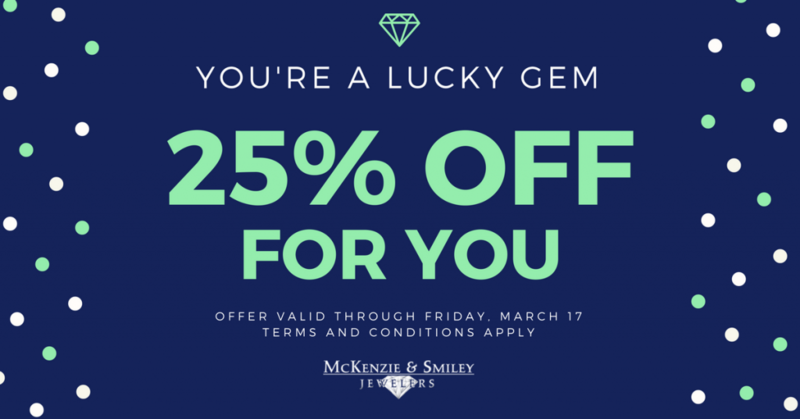 Just show this coupon in-store to save 25% on your next purchase, valid until Friday, March 17th. *Offer excludes Pandora, Tacori, Rolex. Cannot be used in conjunction with any other promotion. Written by Pamela Smiley on January 20, 2017 . Posted in Uncategorized. Two-tone designs are always in style! Even if all your jewelry is white, a two-tone piece doesn’t clash. 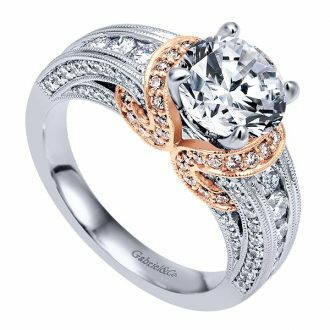 Rose gold is used perfectly in this engagement ring design, accenting the gorgeous curves and drawing the eye to the center diamond. What’s better than one band of diamonds? Two bands of diamonds! 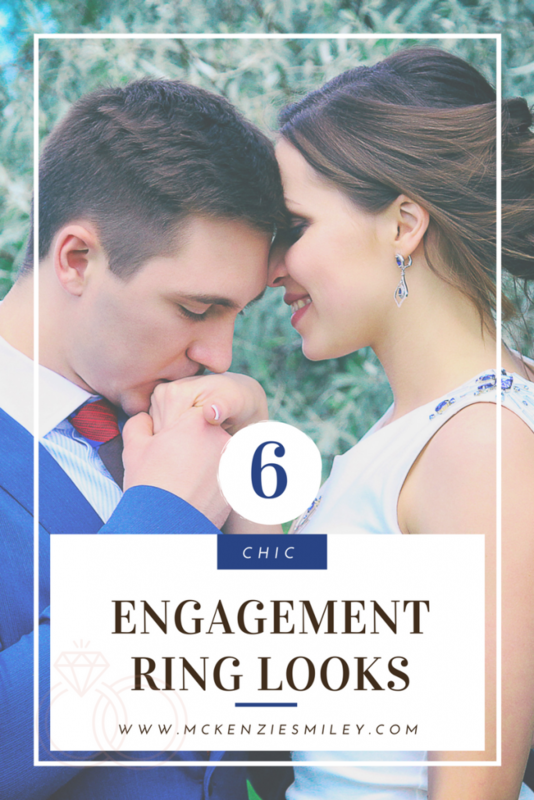 It’s twice as pretty and gives any engagement ring a more modern, architectural feel. Elaborate details on the sides mean your ring will look amazing from every angle. 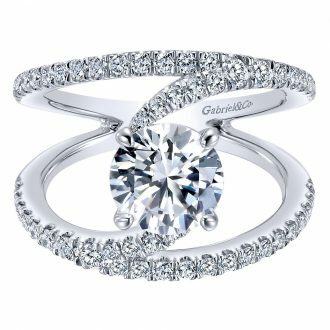 We love the way this setting cradles the center diamond and dances around the band. There’s a reason why this pink gold is so popular—it’s feminine rosy hue flatters all skin tones. Colorful diamonds are a beautiful choice for your engagement ring. Fancy colors like yellow and pink, stand out from the crowd without feeling too over the top. If you’re looking for a modern statement, try chocolate or black diamonds. Designs inspired by nature really took root (see what we did there) during the Art Nouveau period. 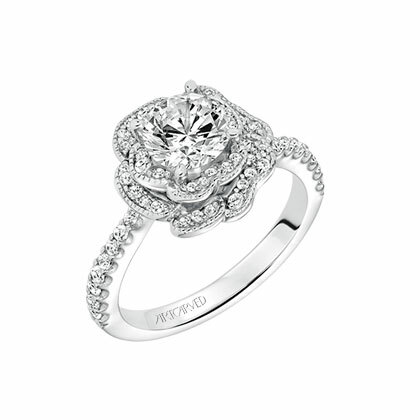 Now, engagement rings feature flowers, leaves, vines and other details taken right from the world around us. 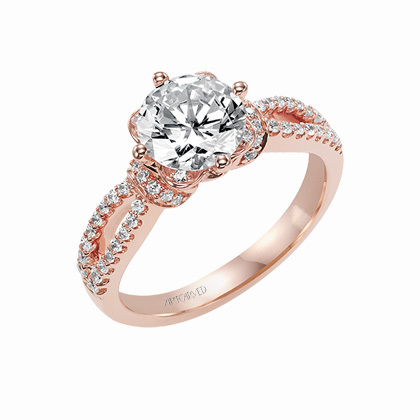 This rose halo adds a feminine touch to this ring. Written by Pamela Smiley on November 3, 2016 . Posted in Uncategorized. 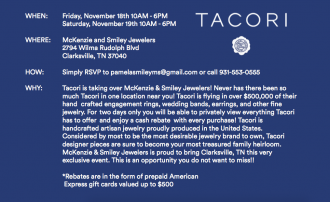 Tacori is taking over McKenzie & Smiley Jewelers! Never has there been so much Tacori in one location near you! 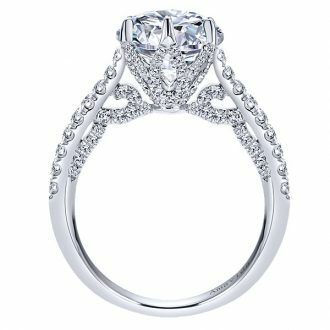 Tacori is flying in over $500,000 of their hand crafted engagement rings, wedding bands, earrings, and other fine jewelry. 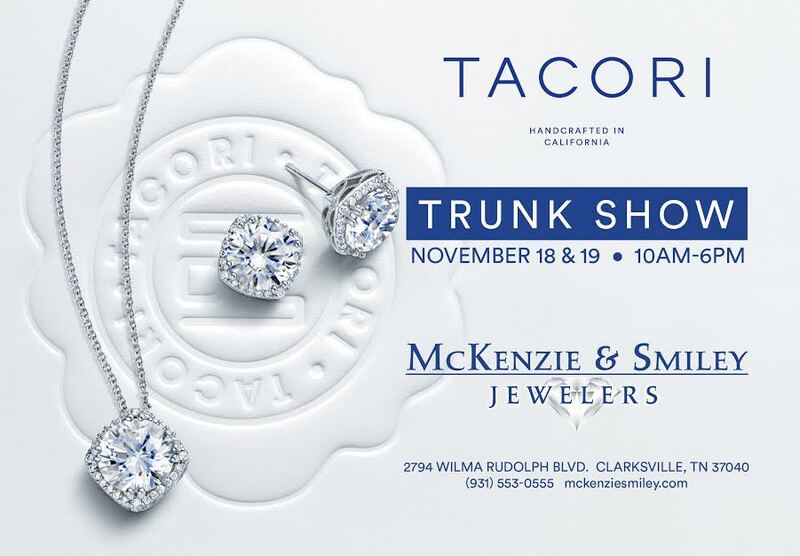 For two days only you will be able to privately view everything Tacori has to offer and enjoy a cash rebate with every purchase, don’t miss this one-of-a-kind event!